I got my Ultra Smart Charger yesterday and I have some problems. When i start a new charging cycle, the LED turns red and after 5 sec it starts blinking blue, it turns red again and then starts blinking blue.. You get the picture. I have tried with different batteries and different usb ports. Even hooked the charger up with my cellphone charger. It does not make any difference. I can provide screenshots if needed. That's actually quite normal when charging in "Normal" mode. In that mode, the charger will charge one slot for 5 seconds and then switch to charging the other slot for 5 seconds and so on. If only one slot is in use, it will charge that slot half the time and flash blue during the pauses. 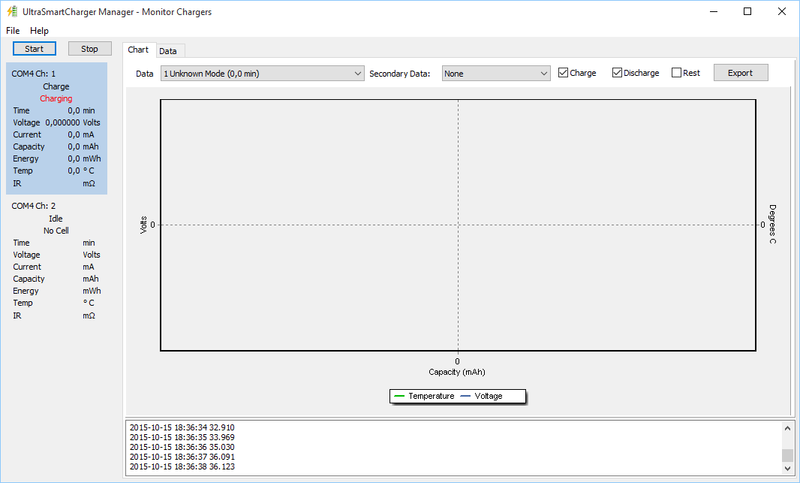 If you're wanting it to charge a single cell without pausing, you can use the configuration manager software to change it to charge in "Fast" mode. When you have got it in this mode, if you insert 2 cells, it will first charge one cell completely and then start charging the other. If you have any further problems, just let me know! 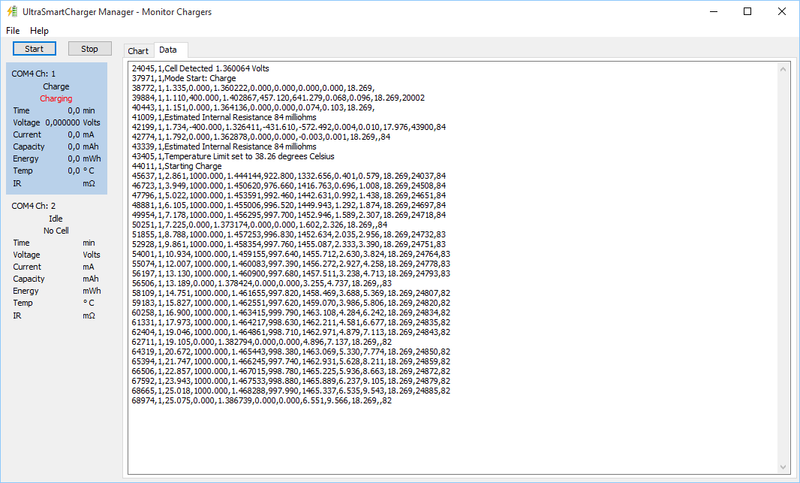 I changed to fast charging in USCManager. It still changes between charging and waiting to charge, but the rate is much faster now. Is there a reason why I dont get any charing information? Even in fast charging mode, it will pause for a fraction of a second every 5 seconds - just to measure the cell voltage whilst no current is flowing - it improves the accuracy of the measurement. You should just see the LED go from red during charging to briefly off without any time showing as blue - let me know if you're still seeing any blue. I'm not sure why the data isn't being shown - what can you see under the "Data" tab? I completed a full charge of a eneloop pro cell yesterday. But unfortunately there was no graphs or other charging info. Only rows of data under the data tab. I need to find another PC to see if I get the same results there. This is a screenshot of a new session with another battery. I've got an idea on what the problem might be - I'll try to take a look at it tonight and let you know what I find. Sorry about the delay in responding. It looks like it's something to do with the localisation settings in Windows - I'll need to dig a bit deeper to find out where exactly the problem lies. you're probably on the right track. Based on my SW-development experience: different treatment of CSV files. I saw you're an HP200LX user and I want to make you aware of a mailing list for that device. It's a great source for all things related to that DOS palmtop with members from all across the globe. Everyone else, I apologize for being off-topic! OK, I've just updated the software to fix the issue where no data was showing - sorry it took so long for me to get back to this!